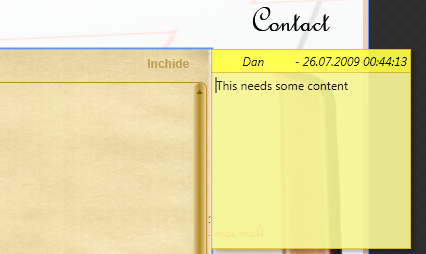 In Blender 3, between some more nice thing there is a very nice functionality similar to Sticky Notes in Vista or Windows Seven . The possibility to add notes in you’re project right on the element you need that information to be. This is very useful to keep track of you’re work and To Do’s. You select you’re object from the Object Panel and from the top menu from Tools select Create Annotation, and a note will appear in the right side top of you’re object. The faster way is to use the shortcut Ctrl+Shift+T. 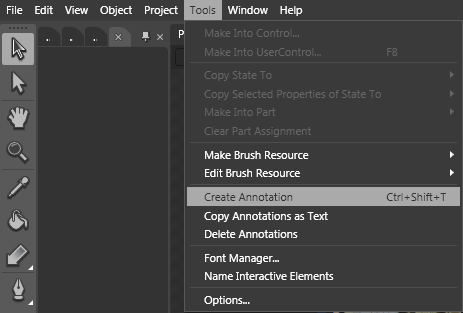 From Tools select Create Annotation or press Ctrl+Shift+T. This entry was posted on July 26, 2009, 1:06 am and is filed under Uncategorized. You can follow any responses to this entry through RSS 2.0. You can leave a response, or trackback from your own site.